Jordan Dartis was given a golden opportunity; and boy, did he seize it. Dartis got the ball with the game tied and shot clock expiring and hit a step-back 3-pointer to give Ohio the lead with 24.5 seconds left. His jumper capped a furious comeback that saw the Bobcats erase a 15-point deficit and emerge with a 72-67 victory over the UNC-Greensboro Spartans in the College Basketball Invitational quarterfinals. Tony Campbell and Jaaron Simmons combined to spark the Ohio run, setting up Dartis to regain the lead at 2:41 and hit the go-ahead shot. The trio teamed up to score all of the ‘Cats points in a 25-5 run to end the game Monday night. Dartis, an All-MAC Freshman Team member, finished with 14 points and hit two of his three 3-point attempts when it mattered most. Ohio forced stops on 11 of the Spartans final 13 possessions. 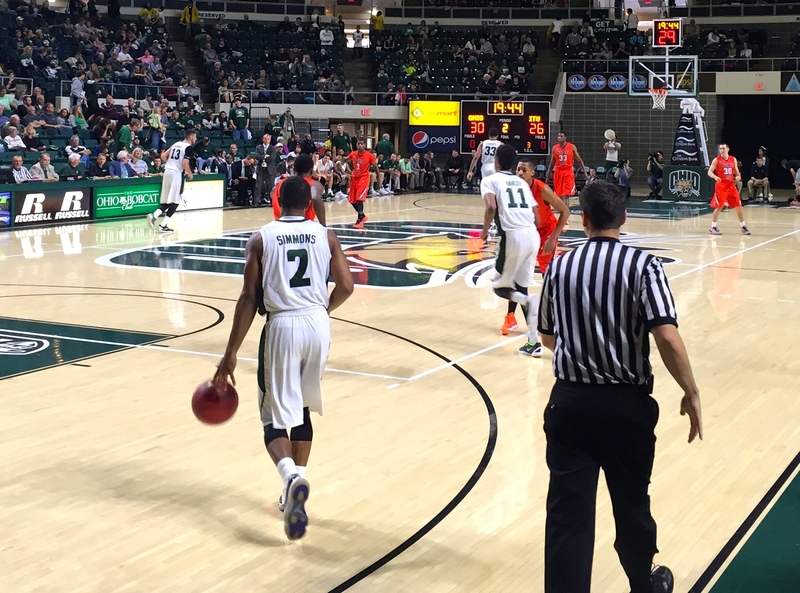 The Bobcats stepped up the on-ball pressure and caused two UNCG air balls during the stretch. “Our overall defensive intensity turned on a dime when things a little bit chippy in the game,” Phillips said. Campbell recorded yet another double-double. This time he, the MAC Player of the Year, did it with 17 points and 19 rebounds. Monday-night’s performance was Campbell’s 17th double-double of the season. Simmons led all scorers with 19 points and eight assists. An assist in the first half moved him past D.J. Cooper to become MAC’s all-time single-season assist leader (268). Simmons will have a chance to thrash the record on Wednesday night, when the Bobcats host Morehead State in the CBI semifinal. The winner of Wednesday’s semifinal will take on the winner of Nevada vs. Vermont in a three-game series for the CBI championship.